We present a new signature scheme which is existentially unforgeable under chosen message attacks, assuming some variant of the RSA conjecture. This scheme is not based on “signature trees”, and nstead it uses the so called “hash-and-sign” paradigm. 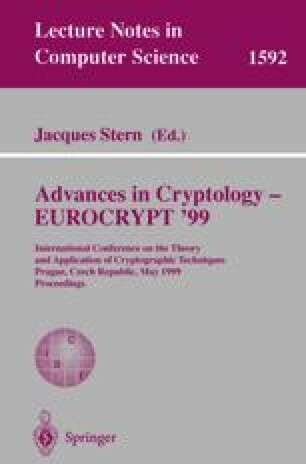 It is unique in that the assumptions made on the cryptographic hash function in use are well defined and reasonable (although non-standard). In particular, we do not model this function as a random oracle. We construct our proof of security in steps. First we describe and prove a construction which operates in the random oracle model. Then we show that the random oracle in this construction can be replaced by a hash function which satisfies some strong (but well defined!) computational assumptions. Finally, we demonstrate that these assumptions are reasonable, by proving that a function satisfying them exists under standard intractability assumptions.